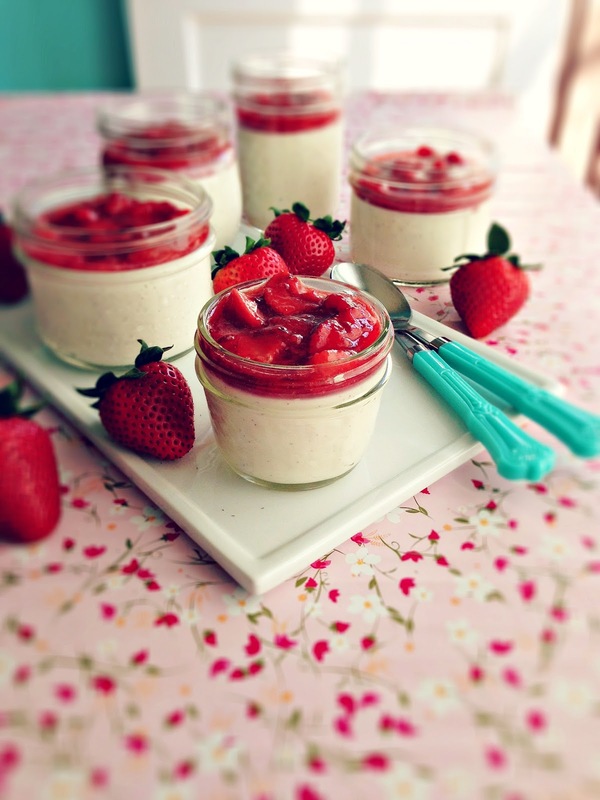 To celebrate Mother's Day I whipped up a little panna cotta for us. Tell you a secret - I've never, ever tried panna cotta before - and now I don't know how I can live without it. So simple, really and with just a few good ingredients, this is the ideal make-ahead dessert. The hard part is waiting for it to chill before you can tuck into its creamy goodness. But it's only a two hour wait, leaving you lots of time to chill out with yo mama. Or your kids. Or your cats. Panna cotta is literally cooked cream in Italian, and that is pretty much what we do to make such a magical dessert, with gelatin powder the secret ingredient. Gelatin is not something I'm used to using in my baking repertoire, but Mom always said to try new things. And so I do. Just sprinkle some over water and let it set up while you simmer cream, sugar and vanilla beans. Here's what a goof ball I am sometimes. The recipe I was using said to only use 1/4 of the bean, but I mustn't have read that part because I used the whole darn thing, scraping all of those beautiful seeds into my cream. At first I was like, oh wow, this is going to be a whole lotta vanilla action, but in the end, it was perfectly delicious. No need to worry. So do use the whole bean, I wouldn't lead you astray. If you don't have any vanilla beans in your larder, a drop or two of pure vanilla extract will be fine, you just won't get those pretty black dots in your pudding. Once the cream has come to a simmer, the gelatin is whisked in, along with buttermilk and sour cream. Divide into your prettiest jars or ramekins or serving dishes and stash away in the fridge for 2 hours or longer. The beauty in all of this is that you can prepare this way in advance. Hello, perfect party dessert. Let's talk about the compote for a sec, because it's a good one. So good I think I want to make more and put it in jars, and call it jam. Amy would be so proud! Compote is just fancy talk for sauce. All that went down was me slicing some strawberries and simmering them along with dried lavender, sugar and a bit of salt. You can find dried culinary lavender in all sorts of shops, just check around. I really love baking with lavender because it adds such a lovely floral dimension to desserts; I recommend seeking some out. That being said, if you omitted the lavender, you still have a great dessert on your hands. Just be sure it's 100 % cool before topping your creamy concoction. You can make this sauce well in advance as well, and as an aside, it would be a wonderful filling for vanilla cake or spread on scones or even ice cream. Seriously - endless possibilities exist! 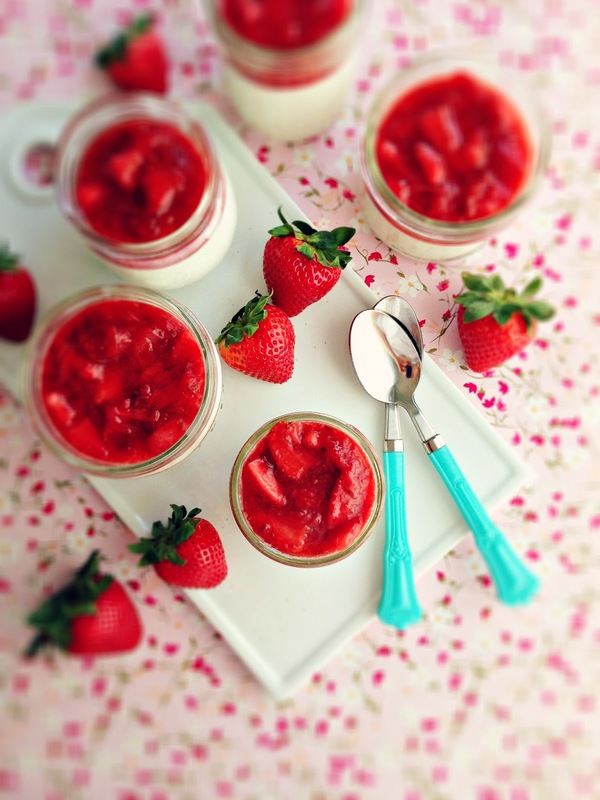 When ready to serve, just dollop some on top of your panna cotta. One spoonful and you'll know what all of the fuss is about: a little tangy, a little sweet, with bursting strawberry flavour and a little note of lavender that just whispers hey, spring is here. Happy Mother's Day - and if you are a single mom, I know you can't see me, but I'm toasting you especially. Place 1/4 cup cold water in small bowl.and sprinkle gelatin over. Let stand 10 minutes. Meanwhile, heat cream, sugar, salt in small saucepan. Scrap in the vanilla bean seeds and throw the whole pod in too. Bring just to a simmer, whisking occasionally. Add the gelatin and stir until dissolved. Remove from heat and let cool 5 minutes. Remove the vanilla pod and whisk in buttermilk and sour cream. Divide into 6 - 8 small serving dishes or jars and chill until set, at least 2 hours. Once set, top with the strawberry-lavender compote. Can be made up to 5 days ahead. 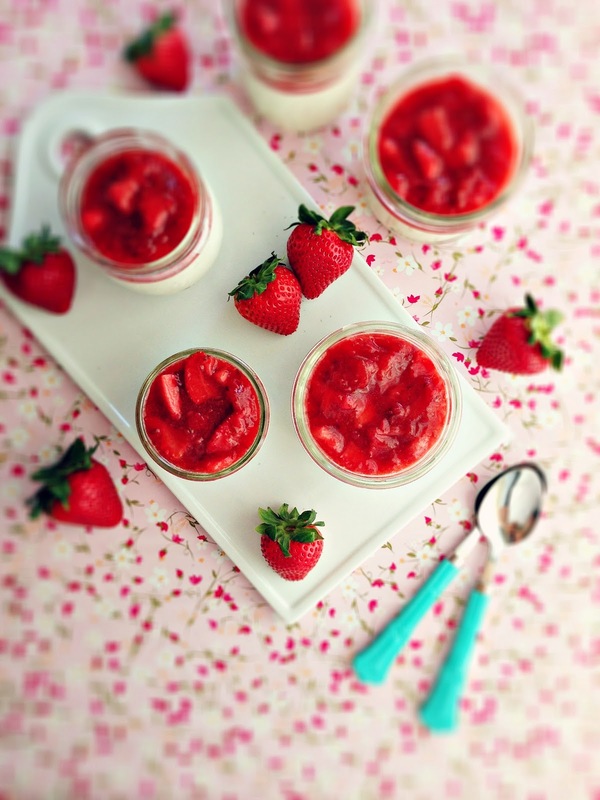 Place 1 cup of strawberries and remaining ingredients in a saucepan. Cook over medium high heat until berries start to break down, about 10 minutes, being sure to stir often. Reduce heat and continue cooking until sauce coats the back of a spoon, about 15 to 20 minutes. Take the back of your spoon and smoosh the berries, breaking them up even further. Add the remaining cup of fresh berries and cook for 5 minutes longer. Remove from heat and cool completely. What stunning photos! Your mom sounds really sweet. Thanks for sharing. Your Mom sounds a lot like my late mother-in-law, who suddenly found herself a widow with four small children (my husband was fifteen months old). Strong, resourceful, courageous, and proud of her family. Have a wonderful day with your Mother, enjoy every precious moment. Sweet post Renee! Looks delish!! Donna - thanks for sharing that. I definitely will. Your pictures are so pretty! I just love the little blue spoons and all the pretty reds and pinks. So lovely!! I've never tried panna cotta before either. Don't really know why, but I will try this! 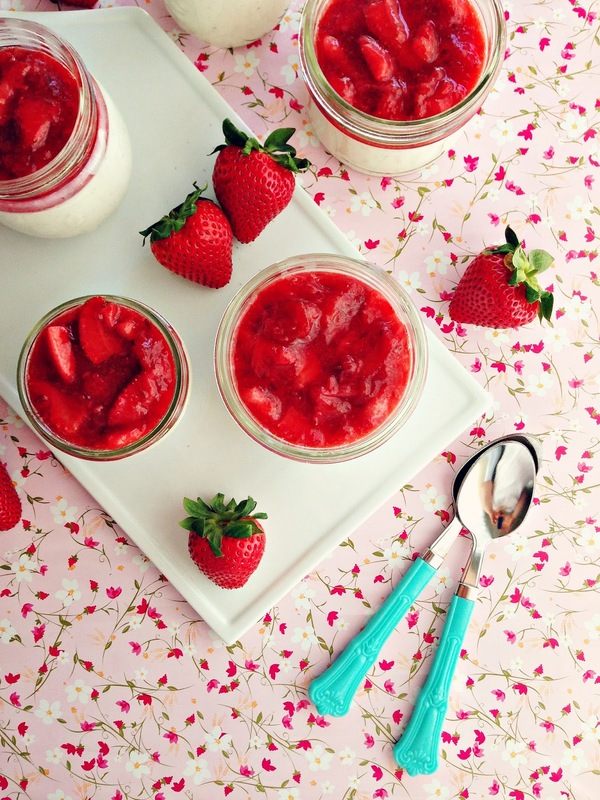 Looks so good with the strawberry compote! Kristen - thank you so much! I got those blue spoons from Target last summer and I love them too! 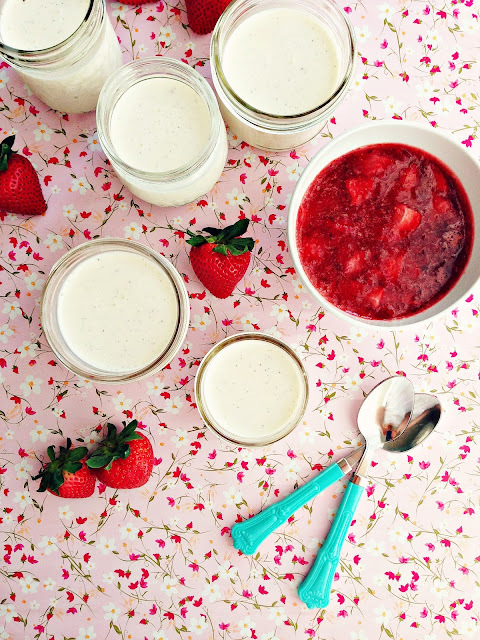 Agi - I was happily surprised by this panna cotta - definitely will make it often this summer. And that compote - so good! oooh i used to be so judgemental about panna cotta! my attitude was - isn't it just vanilla jell-o...and isn't that just pudding? then i had it at a work event last year, and it was just so dreamy creamy and i loved it! still haven't made it though...will have to make your recipe soon! Your photos are disgustingly awesome. Hi Liz! Thank you so much! Glad you found me! Robyn - I hear what you're saying. 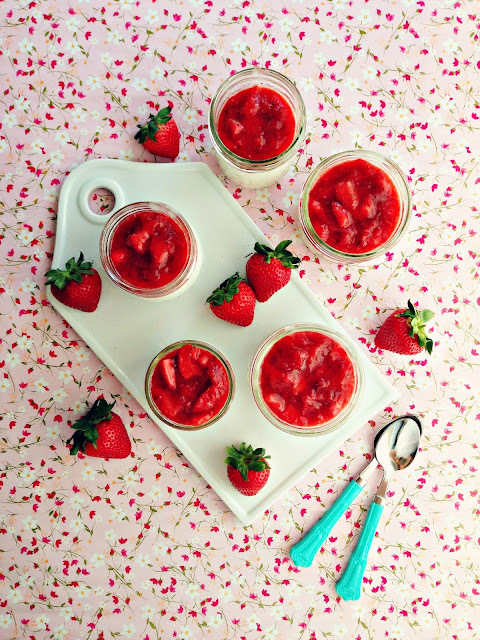 Panna cotta is so much more than vanilla pudding. Dreamy creamy pretty much says it! Renee, Everything is just right about this post... I love what you said about your mom and panna cotta with strawberry compote feels spot on this time of year. Yum! I made panna cotta for the first time earlier this year as well. It would be lovely in small jars wih ny seasonal fruit, but this sounds especially delicious Renee. What a lovely post! And totally stunning photos!! So beautiful. So gorgeous! Love the colours and the flavour combination. Erin - thank you! I'm doing well, loving this spring weather (and strawberries too). Val - thank you. I have a feeling I'll be making this quite regularly over the summer. Jan - thank you! The lavender is a definite highlight! This is such a gorgeous looking dessert and your photos are stunning! I've never tried making panna cotta, but you've made me really want to! Lovely recipe, photos and story about your mom! I'm so tempted to make this tonight. I'd be willing to stay up late for it to set. :) I love panna cotta!! Rosie - thank you! You should totally try this recipe; it's so easy and so delicious! Christina - thanks lady :) Make it tonight and enjoy it for breakfast!